After 4 1/2 months this is what I have completed. I had purchased the plans for your 18' Bo-Jest and have followed the plans for the hull to a "T". However, I made several alterations to the cabin to suit my liking, such as extending the cabin roof to cover the rear deck and added canvas drop curtains which makes it more comfortable in bad weather. The interior has a fresh water tank beneath the floor (20 gal.) and a cupboard with sink and pump and exterior drain. I also installed a marine-type toilet and a 20 gal. holding tank under the floor in the sleeping area. I power it with a 15hp Merc O.B. with remote controls. I have added a VHF radio, depth and fish finder, spot light, horn, Loran, compass, bilge pump, etc. 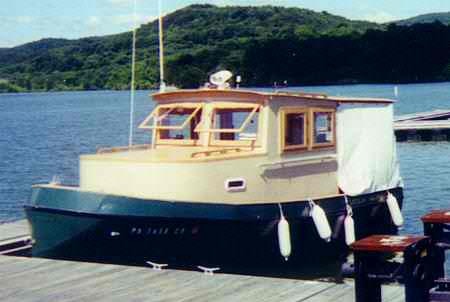 I have boated on our local lake where this picture was taken, also in the Chesapeake Bay, and NY Finger Lakes. Everyone who sees it has complements and there have been at least 50 people who have taken pictures of it. My wife and I have spent many weeks cruising and fishing, living on board in comfort for days at a time. I have added a downrigger and it is the perfect boat for lake fishing and trolling. I am very proud of this boat and people repeatedly ask me how much I would take for it. My reply is "you don't have enough to buy it". I thought that you may sometimes wonder what becomes of the plans that you sell, so I thought I would share what became of mine. In addition to countless days of work I have a cash investment of approx $12,000 which includes the used motor and tandem axle trailer and all accessories. PS. The name of the boat is "Dixie Queen".